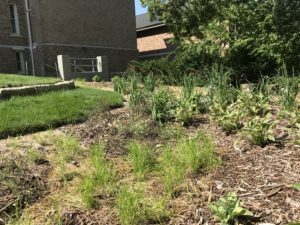 The Dundee Elementary Green Infrastructure Outdoor Classroom was a collaborative project between Dundee Elementary School, the City of Omaha Stormwater Program, and Keep Omaha Beautiful. 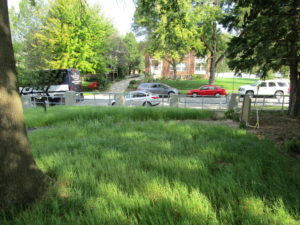 Lack of sunlight and limited vegetated areas, in conjunction with rain events, caused significant runoff and erosion problems on the north side of the school. Green infrastructure practices were used to alleviate these issues while creating a unique educational opportunity for both students and the surrounding community. Funding for this project was acquired through grants from the Nebraska Department of Environmental Quality, the Papio-Missouri Natural Resource District, and the Nebraska Statewide Arboretum. 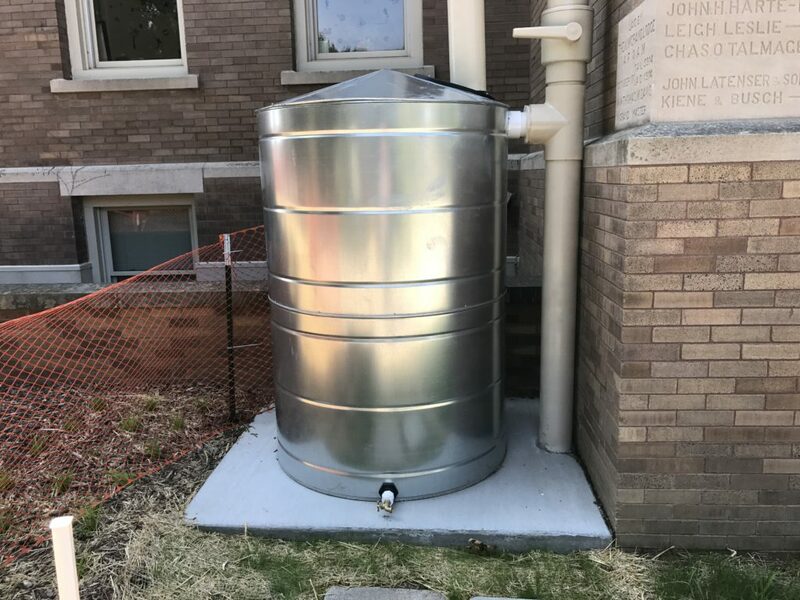 A 500 gallon galvanized steel water tank was attached to one of the downspouts on the north side of the school. 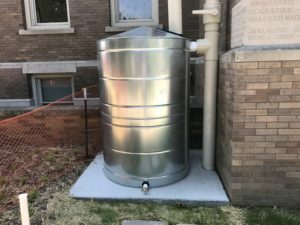 The rain silo was fitted with a water spigot and hose attachment at its base, providing a way to use collected rain water for watering plants on site. A simple ball valve with removable handle was installed as a bypass feature, allowing water to be diverted away from the silo during the winter. Permeable pavement occupies roughly 13% (3,305 square feet) of Dundee Outdoor Classroom. 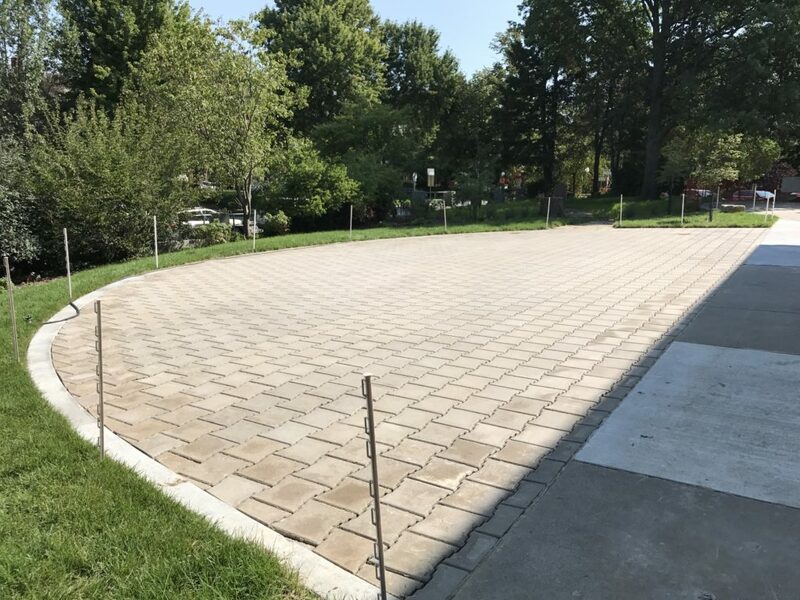 Permeable pavers were used to construct two outdoor patio areas and a 65-foot long driveway on the north side of the school. The two patio areas provide an excellent space for teachers to lecture and acts as a gathering spot for parents when dropping off or picking up kids from school. Two large bioswales stretch through this site connecting all three rain gardens to each other. Bioswales are used as a means of transporting water through a vegetated area, allowing stormwater runoff to spread out and soak in to the ground. For more information check out the Dundee Project Fact Sheet.